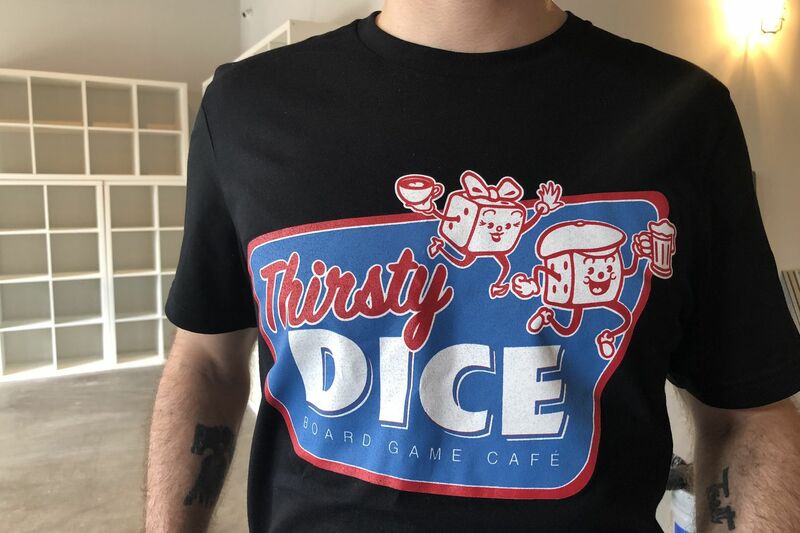 Thirsty Dice, 1642 Fairmount Ave.
You've heard the story time and again: Corporate exec tires of the rat race and changes careers to something he actually enjoys. You have bars with bowling alleys, bars with Ping Pong tables, bars with virtual-reality headsets, and bars with ball pits to frolic in. Board games line the rear wall at Thirsty Dice, 1642 Fairmount Ave.
At Thirsty Dice, Hendricks and crew offer a library of 800 games, neatly shelved in an industrial-look room. Customers come in, pay a $7 "sitting fee," choose a game with the help of a "gametender," and sit and play. There's a full bar and a snack menu. Hendricks and his wife, Lynn, elected to roll the dice last year. During a 10th-wedding-anniversary trip to Toronto, they visited North America's first board-game cafe, Snakes & Lattes. "I was just amazed at how they make it accessible to people," he said. "I started doing research, and I went to about a dozen different board-game cafes to get a sense of how people were implementing the model, and it just seems like it would be a great fit in Philadelphia. So right before the end of the year, I pulled the trigger on the lease." Matt Hendricks with part of the game collection at Thirsty Dice, 1642 Fairmount Ave.
Hendricks, a rookie in the hospitality business, had help from assorted locals, including former classmate Ben Fileccia (a longtime restaurant manager) and Rebecca Foxman (of Fox & Son Fancy Corn Dogs, who helped design the menu). Dylan Love, a Garces restaurant veteran, is managing the day to day. Fileccia provided Hendricks' first sounding board. Hendricks said he sat him down, and as he ran through a PowerPoint, he told Fileccia to be brutal in his assessment: "I want you to punch me in the face." Fileccia did not take him up on the offer. What to play? You can go basic with the classics such as Guess Who, Aggravation, or Battleship. Kids can play, too. You can also go more esoteric. One of Hendricks' favorites is Tichu. "It's basically based off of a Korean card game that's very popular in Asia called Big Two," he said. "It's a partnership, four-player card game. I've been playing that for over 20 years, and I still love it." He also likes Azul. "You're putting these beautiful chunky plastic tiles on this board, and it kind of scratches the same itch as Candy Crush would on your phone," he said. "But it's got this beautiful, tactile component to it, and when you're sitting and playing with one or two or three other people that you enjoy having a good time with, it really takes the experience to a different level." French bread pizzas and mac and cheeses at Thirsty Dice, 1642 Fairmount Ave. Menu — subject to change — includes corn-dog "lollipops," mac and cheeses, snack bowls, and French bread pizzas, plus desserts — many of which are based on Bassetts ice cream. Hot drinks are provided by Herman's Coffee. A dozen beers on tap (many more in bottles and cans), five cocktails (all with game names, including the Shandy-land, a play on a shandy crafted with house-made ginger lemonade), three draft wines (plus six more by the glass), and milkshakes round out the drink list. Initial hours are 4 to 10 p.m. Tuesday to Thursday, 4 p.m. to midnight Friday, 11 a.m. to midnight Saturday, and 11 a.m. to 10 p.m. Sunday. Part of the game collection at Thirsty Dice.